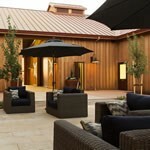 Visiting Oak Farm Vineyards (OF), you will experience our passion for wine and hospitality. We invite you to come enjoy our wines as you relax within the sweeping vineyard views and historic oak trees surrounding our property. This beautiful setting is perfect for a picnic lunch! Structures on the property have a level of history that date back to the mid 1800’s. We joyfully and artistically strive to create exciting small-lot wines from our vineyards and the Lodi Wine Country Region. Our goal is to keep all the wines in balance and showcase what amazing flavors and aromas the fruit has to offer. Oak Farm Vineyards is a 21 and over facility.